Simply Put: Get more massage. 2. Get a massage from someone who has been doing it longer than you. 3. Get a massage from someone who just got out of school. 4. Get a massage from someone who specializes in specific techniques. 5. Get a massage from someone who blooms as a generalist. 6. Get a massage from someone who only uses his or her hands. 7. 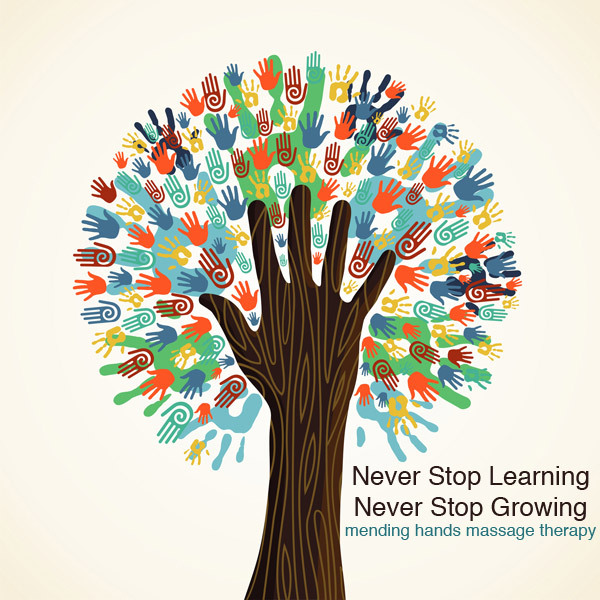 Get a massage from someone who uses their hands, forearms, feet or any combination of body parts. 8. Get a massage from someone who loves an array of bells and whistles (like aromatherapy, heat therapy, cold therapy, stones, bamboo, scrubs, paraffin wax and the like). 9. Get a massage from someone who keeps it simple. 10. Get a massage from someone who loves myofacial release, tapotement, range of motion and vigorous petrissage. 11. Get a relaxation massage. 12. Get a massage in silence. 13. Get a massage with music you have never heard or a soundscape you might have tried on your own. 14. Get a massage on your own table, in the space you work in. 15. Get a massage when you are feeling emotional. 16. Get a massage when you are in pain. 17. Get a massage when you already feel great. 18. Get a massage with the intention to learn. 19. Get a massage with the intention to let go. 20. Get a massage as a paying client to respect and value time, skill and treatment.